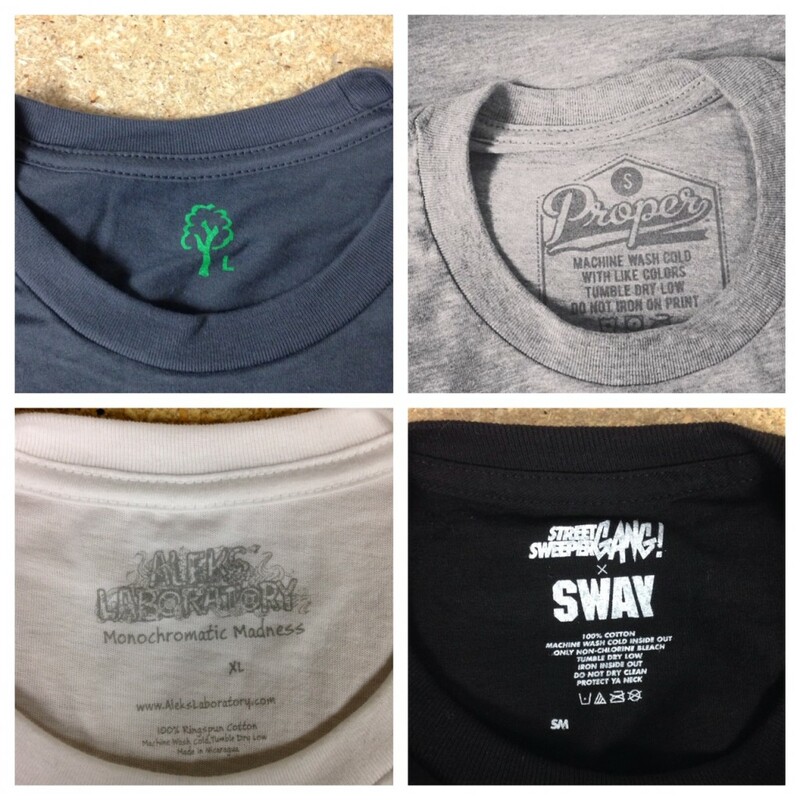 One of our services is printing tags on the inside neck of t-shirts. Its a finishing touch for companies and brands to achieve a polished and professional look that will impress your customers every time they put on their shirt. Tag printing is the small detail that separates the basic promo shirts from the hi-end clothing brands. Heres a few pointers and guidelines for tag printing. Size: 2.5″ x 2.5″ inches is an average starting size. You can a little smaller or larger if needed. Tear-away tags are your friend! 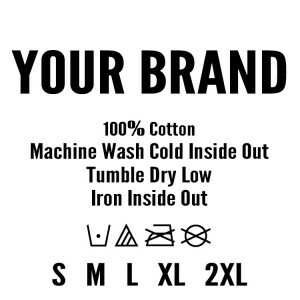 Many brands now offer shirts that have tear-away labels so that we can remove the original tag with no mess and print your custom tag inside. Brands that offer tear-away tags: Next Level, Alstyle, and Tultex. Garments with sewn in labels can be printed and cut out by hand however does not look as seamless. Tag printing is primarily done in single color, so we advise keeping your tag artwork simple. We can cater to multiple color tags, however it will be considerable more to setup and print. You can print any color for the tag, however gray is the most common choice for good reasons. Gray tags will be visible on most colored t-shirts so you can print the same tags for t-shirts that are black, white, red, navy… just about any color but gray t-shirts. Gray also will not show through the back of thin white t-shirts like other colors will. Add something personal or funny. – “Be somebody!”, “Hand printed with love”, “You Only Live Once” add your motto or website, etc. Its your tag and your t-shirt go wild. Use a bold legible font. Using a font with lightweight or script font may be hard to see. If you do not have tag artwork or the means to create it our art department can create something for your brand. When printing text in the negative space be sure not to use to thin a font. Prints like this will be forgiving to fine detail in tags. Download our Tag Template and customize is it to your design. There are 2 ways to provide tag artwork. Provide artwork for each size separately. *This may incur an additional screen charge for tags when printing.